Musculoskeletal – Not As Complicated As It Sounds! This may seem like an extremely complicated word, but the definition and explanation that follows will simplify things for you. The human musculoskeletal system provides stability, support and movement to the body. It consists of skeletal bones, muscles, cartilage, tendons, ligaments, joints and other connective tissue. Combine these together and a healthy musculoskeletal system will help the body function at its peak. The skeletal portion of the system helps to store calcium and phosphorus. A constant level of calcium in the blood stream and the adequate phosphorus levels in cells is critical for the function of all our organs, but particularly for the nerves and muscles. Can It Let Us Down? The musculoskeletal system can let us down sometimes. People can develop musculoskeletal conditions that affect the joints, bones and muscles. They can also, in rarer cases, develop autoimmune diseases. There are more than 200 musculoskeletal conditions that affect 1 in 4 of the British population and account for over 25% of all surgical interventions in the NHS, according to Arthritis Research UK. Here is a handy little list of the most common conditions which can affect anyone of any age. 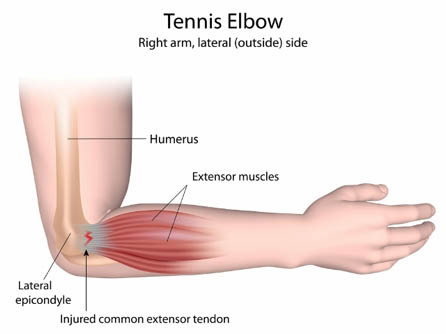 Otherwise known as Tennis Elbow, tendonitis is the swelling of a particular tendon, particularly after injury. Sporting athletes are commonly at risk of tendonitis due to the rigorous training regimes and high-tempo environments. Most medics recommend the RICE method (Rest, Ice, Compress, and Elevate) to alleviate the pain and the recovery time is around 2-3 weeks. Ibuprofen and paracetamol can be used to ease mild pain, although you should wait 48 hours after injury as ibuprofen can slow down the healing process due to the chemicals inside the tablet. CTS is a condition that can lead to pain in your fingers and hands, due to compression in the median nerve, which ultimately controls how the hand operates with the wrist. The carpal tunnel looks like a pathway in your wrist made up of a small percentage of bone and a portion of tissue that mirrors the actions of a pulley, ensuring your fingers move in tandem with the reflexes of your arm. Certain things increase the likelihood of carpal tunnel syndrome. A demographic most likely at risk is pregnant women, with up to 50% of cases of CTS sourcing from pregnancy in women. A long term condition, fibromyalgia causes pain all over the body. As well as wide-spread pain, people who suffer with fibromyalgia may also have fatigue, muscle stiffness, sleeping difficulties and even irritable bowel syndrome (IBS). Unfortunately, it is unknown as to what exactly causes fibromyalgia, however it’s thought to be down to an abnormal level of certain chemicals in the brain. This leads to a change in the nervous system that sends pain messages from the brain throughout the rest of your body. To prevent the likelihood of the above conditions you can take simple steps to take care of your musculoskeletal system. Keep your muscles healthy and flexible with regular exercise, either with weights or even heavy housework. You can also help your system and feel better physically by maintaining a healthy weight. Excess weight puts pressure and strain on joints such as the knees and hips. Activities such as swimming and biking will also help keep your joints flexible and also maintain a healthy lifestyle. For expert advice about your musculoskeletal system, why not consider physiotherapy? If you’re having trouble with conditions such as those mentioned above, a physiotherapist may be able to help you with your issues. We can provide expert recommendations and even give you a variety of treatments to alleviate your pain.